I will be exhibiting in a special one off event next month, along with other artists at a venue in the West End of Edinburgh. 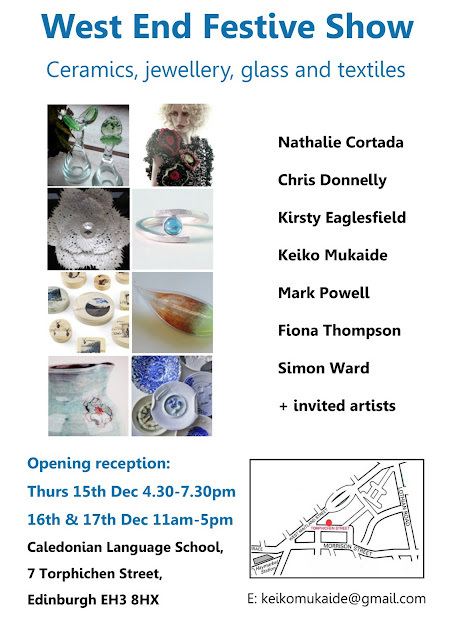 Organised by glass artist Keiko Mukaide, we have hired a space in the Caledonian Language School for a three day festive event. There will be glass, ceramics, jewellery and textiles. Everyone is welcome to visit, details below! Refreshments served on the Thursday evening preview. There will also be a raffle with a chance to win a bottle of whisky plus a hand-blown glass.